← One For the Books! When you book hotels in foreign lands, it’s a wee bit of a crap shoot in hoping you’ve picked a good one. We had an advantage with Akos’ in asking if the one we chose was okay and he gave the thumbs up which made me feel a little better. But still, will there be food; coffee; booze; lack of thieves…ya know, the important stuff. 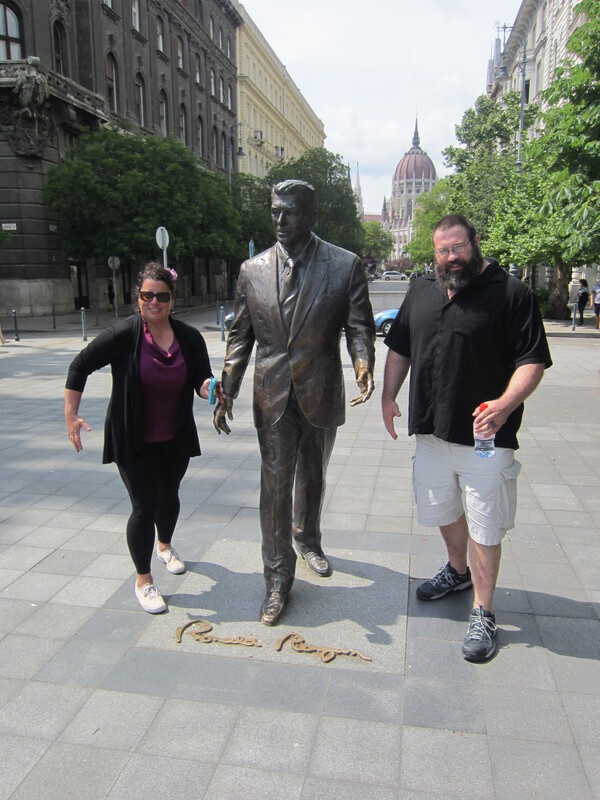 We quickly learned that when you walk in any direction (right right or left left-that’s how Hungarians give directions. I risked it once and went right left and we took about 18 blocks to g0 6 so now I’ll listen to instructions) we’ll find exactly what we need. Tons of food, everywhere. Small city parks right in the middle of the Octogon meant that young people would congregate with their bottles of booze and sit, drink, and laugh. We saw one large group with a bottle of Jack Daniels and a large bottle of Coke. They’d take a slug off the JD and then a sip of the Coke. All the while telling stories and laughing. It was really a fun sight. We’d see groups all over while walking to dinner, some smaller groups or pairs would just be sitting in a doorway stoop with a bottle of wine talking and drinking. Something that is an absolute no-no here in ‘merika! We asked Akos’ about it when we connected with him again on Saturday and told him that we could never do that back home. His reply? ‘Ya, here, Real Freedom.’ Point to the Hungarians. And the Euro youth. Somehow, they’ve all figured out how to drink and have fun and not have an entire SWAT force standing behind them in case one gets out of hand. Huh. Why can’t WE do that? Whoa. That was real. No joke. This entire time, we’ve had no idea what it was to live behind the Iron Curtain and how it was to be free of that. This old man does. He lived it. Most certainly lost a loved one (or more) in the 1956 Uprising. Freedom means more to him than being able to drink out in public all night. It is life. It is speech. It is living without fear. That’s Real Freedom. Directly from those who haven’t had it. This entry was posted in Uncategorized and tagged Budapest Octogon, End of Communism, Freedom, Honeymoon, Hungarian Freedom, Ronald Reagan. Bookmark the permalink.